Red wine is a delicious alcoholic accompaniment to a great gourmet meal, or to laugh with during girlfriend hangouts or for those nights you just want to hang back and enjoy a soothing glass. Any true wine lover will tell you red wine is perfect for most calm nights and really makes you feel good. 1. It lowers your cholesterol. red grapes containing high fiber tempranillo which are used to make certain wines have shown to reduce cholesterol levels in people who add a glass of wine to their diet. So you want to unclog your arteries? Maybe have some wine. 2. Protects your heart. 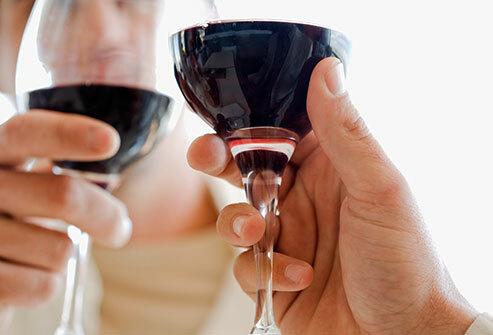 Red wine does not just lower cholesterol, it also keeps your blood vessels flexible and reduces the risk of unwanted clotting, due to the antioxidants in the red wine. Have you had your glass of pinot today? 3. Boosts your brain. In order to keep your brain sharp, it is advised that after really working your brain cells and working it for long periods of time, you should cool your brain with a glass of wine. It relaxes you,and your brain thus giving it a boost after rest. 4. Controls blood sugar. the natural compound in red wine, resveratrol is said to help stimulate insulin secretion or activate a protein that helps regulate glucose and insulin sensitivity. Bottoms up! 5. Red wine helps to fight off a cold. The antioxidants in red wine keep you healthy and you ran a less risk of catching a cold if you have wine as part of your regular diet. 6. Helps you lose weight. Red wine has the natural compound in it, resveratrol which breaks down accumulated fat and blocks the path for immature fat cells to develop.